Why Won’t You Let Me Comfort You With Scripture? Why Would You Push Scripture Away? Let me turn the scenario in the first paragraph around. Believer, what if someone is trying to comfort you with Scripture and you shut it out or push it away? Changes things a bit doesn’t it? I would venture to say that every one of us has done this at one time or another. Not something I am proud to admit but I have. Pride Says, “I got this.” Really! The scriptures teach, “Pride comes before a fall.” Proverbs 16:18. I could go on but I think these get straight to the point! Why We Need To Listen To Scripture For Comfort! 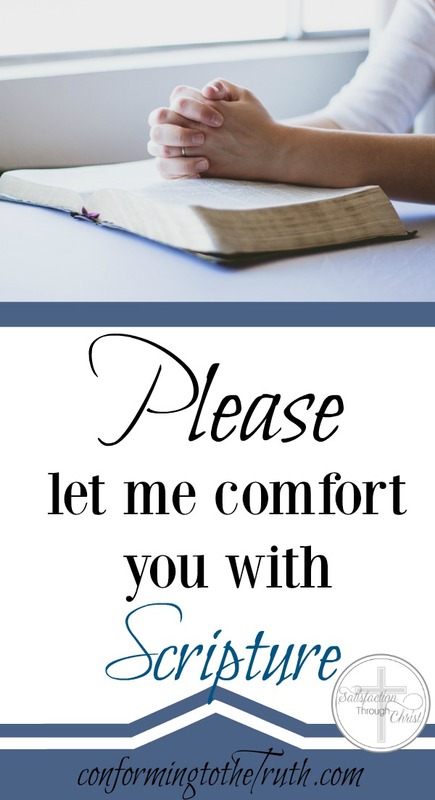 There is a verse in Romans that gives three convincing points as to why we need to receive comfort from the Word of God. perseverance: We keep pressing on through encouragement of the scriptures and we have hope as an anchor for our souls. I have one point that tops all others. I am turning my heart and your heart to one main truth. If we do not get this, nothing I say nor what the scriptures teach will matter. First, let’s read this verse and I believe you will know where I am headed. Scripture Is Our Only True encouragement! If I cannot receive or give the encouragement from the scriptures I have nothing to give, you have nothing to take! God and His word are really the only truth and comfort we have. I in myself have nothing to give you. But if I come to you or you come to me with Scripture we have everything to give and everything to take! I hope and pray these words encourage you and give you something to think about. Let’s use the word of God to comfort and lift each other up! Do you have any verses that you could share with us about the encouragement of the scriptures? I would love to hear them! I do believe the Scripture is really comforting. I have ran to the Word of God for times when I needed it the most and it’s all the comfort I need. It’s amazing. Amen, Lux! It is the only true comfort we need! God’s word is amazing! I totally agree with what you are saying. Can it be pride…yes. But when I was in excruciating pain when my son died, hearing someone just parrot what they thought would help was..well…annoying. What made Jobs friends effective was their time. Their care. A listening ear. Just being present was enough. So many times people would think they had the answers when they had never experienced burying a child. Crying with me meant they were walking this journey with me. And when people put Jesus’s skin on….that is comfort. I have often seen people use scripture out of context or use the wing scripture at the wrong time during the grieving process mostly due to the speakers lack of understanding of the situation or lack of empathy. It’s understandable on these situations to see push back. But when someone uses the correct scripture, it can do a lot of good. Thank you for your insight, Joseph! Unfortunately many use scripture out of context and end up not being a help! Yes!! When it is used correctly, praise God for it! I am so sorry for your loss! I have lost a child myself, very early in pregnancy, so I can relate to a degree. I agree with you Emily! Having someone just being there is a great comfort! My point was not to do away with someone being there I was just trying to say God’s word is our comfort and we need to be careful not to push it away. I am thankful you had people rally around you to comfort and support you! What would we do without God given friends! Thank you for you comment! God Bless!